A few days ago, I shared a couple of cards that I made for an online challenge. As part of the challenge, I was forced to use a colour palette I would not normally be comfortable with, and I’m kinda proud of myself. 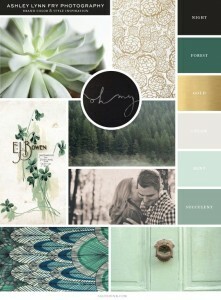 The challenge was based around a VERY green colour theme. Quite specific greens, as well. They were muted, dusty and all had the same tone. This meant I not only had to think ‘how’ to use these greens, but also where on earth I was going to get the actual colours & tones from?! I had a vague idea that using some sort of watercolouring technique would work, but . . . .
. . . . 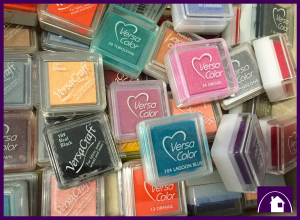 I don’t actually have that many watercolours or Distress colours, so I went to my giant box of Versa Color/Craft stamp pads. It has over 40 colours. Surely I could find the colours I wanted/needed there!?! So I rustled inside the box and yanked out all the mossy/muted greens from light to dark and didn’t even ask myself if I could watercolour with them. You see, Versa Craft/Color stamp pads are pigment pads, and normally you would use a dye-based ink pad for watercolouring. Versa Color/Craft pigment stamp pads ARE water-based, so I thought I was probably in with a chance of using them for a watercolour technique. So here’s how it all came together . 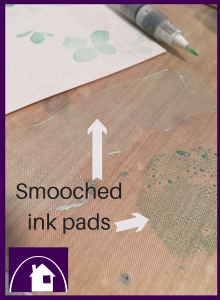 . .
Get a scrap of watercolour paper & then squish ink pad into a plastic surface or onto a glass craft mat. Use a No. 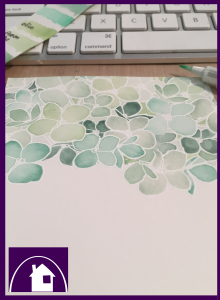 2 round watercolour brush, and Create a colour chart to help decide which colours you will use for your card. 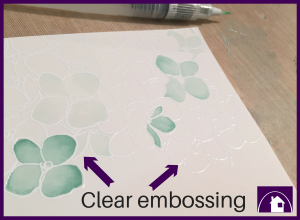 Using a clear embossing ink pad (I use VersaMark) & clear embossing powder, stamp your image on the top left hand corner of the watercolour paper. 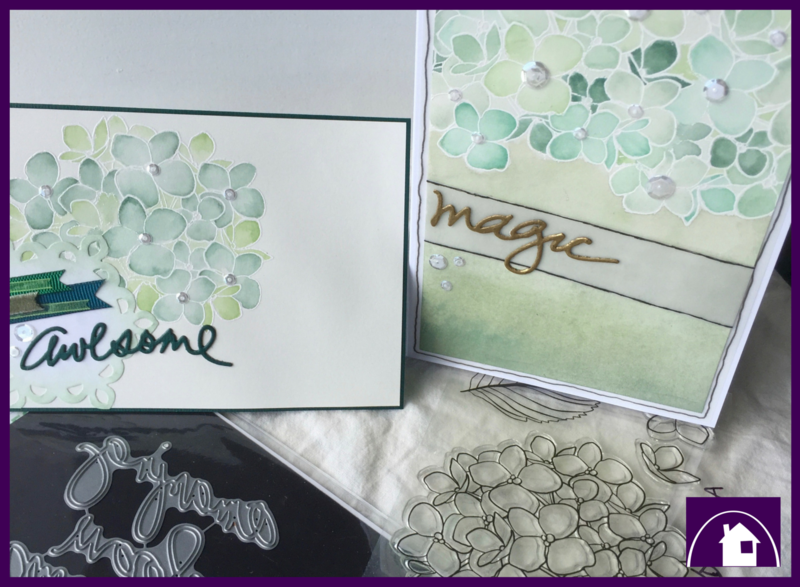 Use a heating tool to set the embossing powder into the embossing ink. Using the chosen colours and your No. 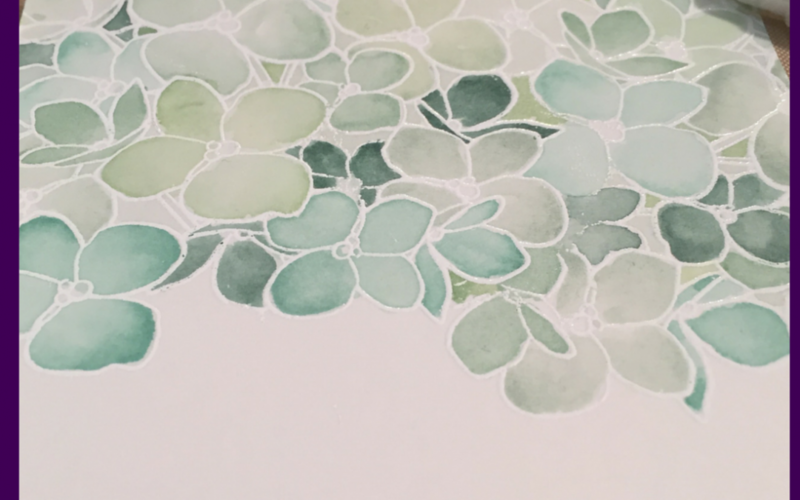 2 round brush, start colouring the beautiful hydrangea image. I concentrated on colouring all the flower I wanted to be darkest and then lighter and finally lightest. 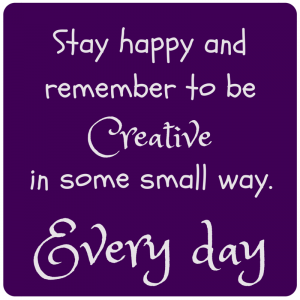 Allow your work to completely dry and then go back add colour where necessary. Choose some background card (I used Bazzill ) to mount your watercolour onto and three or five (odd number!) little pieces of coordinating ribbon. Grab a small doily or cut a circular diecut shape (like I did) and ink the edges with one of the lighter ink pads. 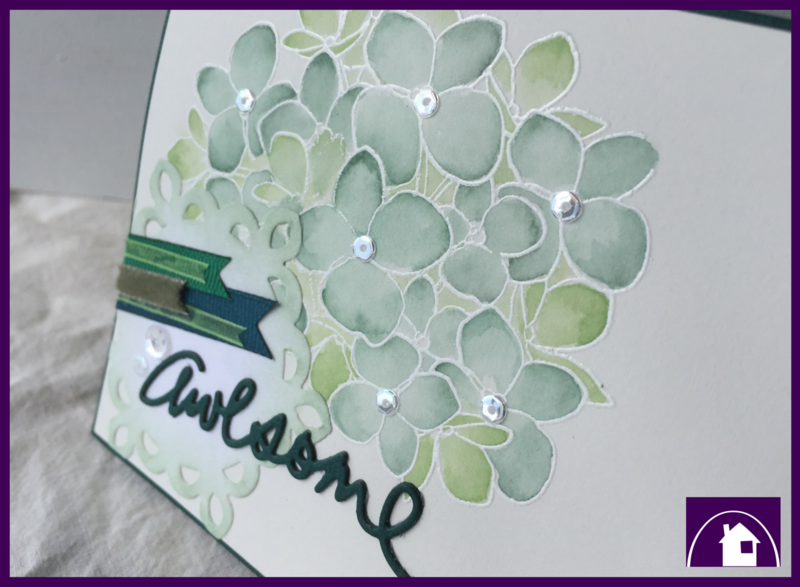 Attach the coloured doily shape between the edge of the card and the edge of the stamped image. 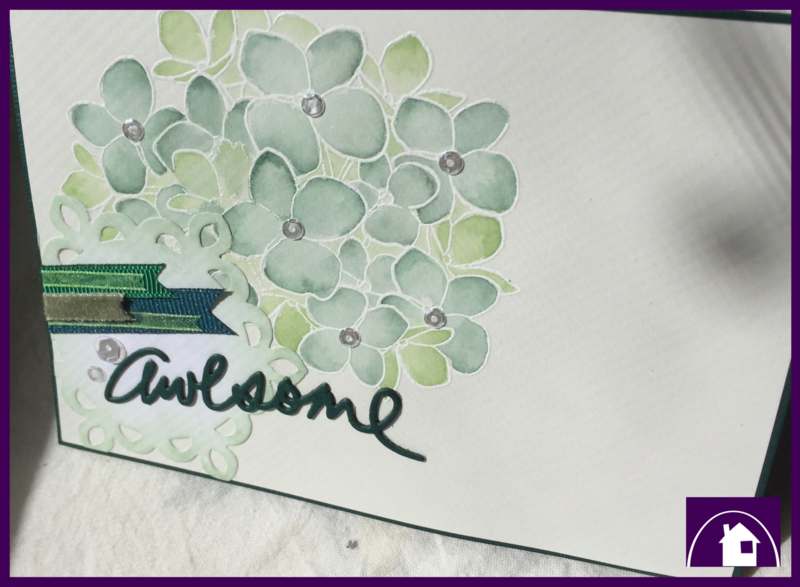 Consider hanging it over the edge of the card and then cutting off the overhang . . . it looks cool! Attach the ribbon – I applied mine on an angle as I thought it looked cooler. I used matt gel medium as it doesn’t leave a sheen like other adhesives and is stronger than double sided tape. 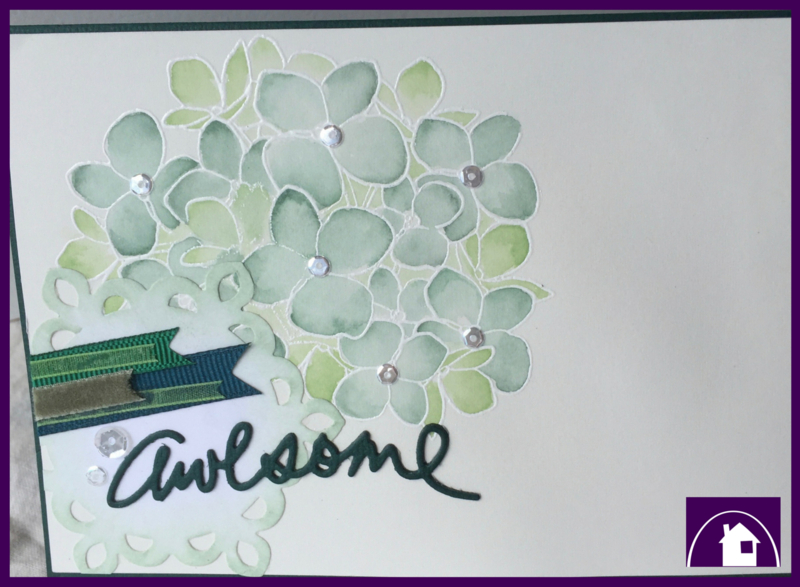 Stamp or diecut a work or sentiment onto the card front. Add some bling in the centre of the flowers, like rhinestones . . . I added clear sequins. 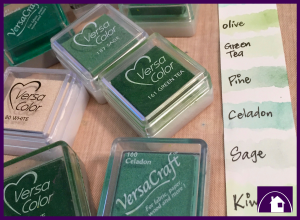 So next time you want to do some watercoloring on a card or within a stamped image, don’t ignore your collection of versa color/craft mini stamp pads.